Buried in a 900-foot tunnel under Riverside Avenue and the Times-Union building decades ago, McCoys Creek has bee n lost to Jacksonville – invisible to the thousands of people who pass over it every day as they drive to and from downtown. The forgotten creek, which flows through several historic urban neighborhoods, can be transformed into a greenway park, with trails, open parkland, and kayak launch sites. 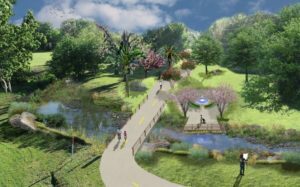 The walking and bike trails will link seamlessly into the Emerald Necklace greenway that will encircle downtown Jacksonville. Right now, city officials are planning a flood-control project for McCoys Creek, where rising water from Hurricane Irma damaged adjacent neighborhoods. The city is allowing Groundwork Jacksonville the opportunity to do much more – to design a creek restoration plan that will go beyond just flood control to include restoring the creek's natural environment, developing its recreational potential, and making the most of the adjacent greenspace with plantings and public art. To this end, Groundwork has engaged Wood Environment & Infrastructure Solutions, (Wood) a multidisciplinary, global engineering firm with extensive expertise in creek restoration and resiliency, natural channel design and green infrastructure solutions to address stormwater runoff and water quality. Groundwork Jacksonville has is raising $300,000 to fund the creek study and restoration plan design. There are millions of dollars in grants available for implementation projects just like McCoys Creek. The challenge is that we cannot access those funds without a comprehensive implementation plan. Your support of the McCoys Creek Restoration Master Plan will arm Groundwork Jacksonville with the tools we need to make this project eligible for matching implementation funds to restore this once beautiful treasure. Concurrently, this plan will advance the city’s project scope beyond just flood mitigation to a more environmentally sensitive resiliency approach that results in a safe, accessible, attractive recreational amenity for all to enjoy. If interested in supporting this planning effort, please contact Kay Ehas, CEO, at kay@groundworkjacksonville.org or (904)401-0453.